Now sporting a brand new detection engine that will work out of the gate without any adjustments necessary in most cases. 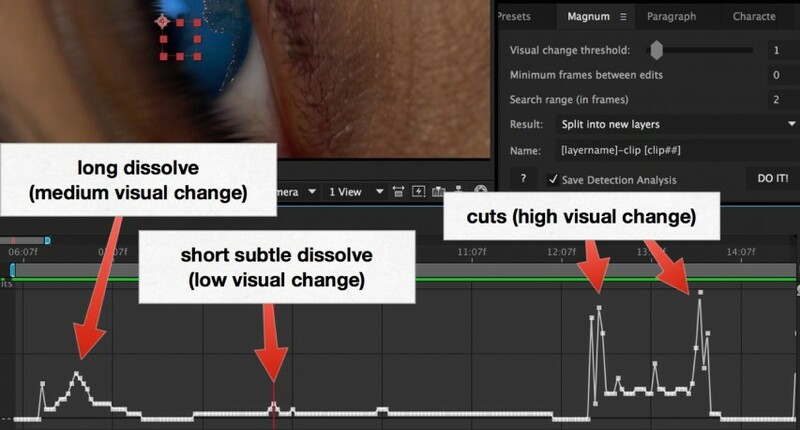 There is also a new feature to tell Magnum how many frames to search across for changes to compesate for dissolves as well as a setting for the minimum scene length to avoid detecting cuts in quick pans or strobbing footage. The powerful Detection Analysis feature lets you graphically see the edits in your footage and set the threshold setting accurately. Magnum will detect a cut at any point higher than the setting. Split into new layers: This mode will split the selected layer into individual layers at every edit. Trimmed pre-comps: This mode will split the layer and then pre-comp it into a comp that is the length of the split layer. Full-length pre-comps: This mode will split the layer and pre-comp it into a comp that is the same length as the original comp. Trimmed adjustment layers: This mode will create a new adjustment layer that is trimmed to the length of every detected scene. Place markers on layer: This mode will create and place markers at every detected edit point. Save thumbnails for each cut/marker: This mode will export a thumbnail for the selected layers or or all layers if none is selected. If you add a text layer named: slate it will burn it into each thumbnail. All special keywords work here as well. Position and style your text before running the export. If you add a text file named: export_template.txt in the export folder it will use it to create an export report file. Again special keywords work here and if you use tabs or commas it will be a spreadsheet. Replace 'layer' with 'marker' in the keywords when exporting thumbnails from markers. Thumbnail size will match the comp resolution. There is a built-in help and help-tips that are shown when hovering over the UI. Upgrade Notice: If you own Magnum v2 (licensed version, the old NYOP version does not qualify) can upgrade for $20. Simply login to the same account that you purchased v2 with and the upgrade price will be automatically displayed. New detection engine. Easier to use, better results!